Yeah, 125 miles of hot, dusty Kansas gravel will absolutely ruin your chain lube game. The trophy wall gleams with this, from Thursday's KCUC Belgian National Day Ride. Hard-earned: 115°F heat index, a blocked stomach and the beginnings of a summer cold that may finally be letting go at this writing. Thanks to Josh and David for a great day out, and cheers to P-4... 1/3rd of the way there, maybe we can start calling this a streak. Looking forward to R-4 on Wednesday, if I'm healthy. Footprints from DK, in downtown Madison, KS., June 4th, 2016. 239th and Pflumm, northern Miami Co., Kansas, looking north on a very hot afternoon's training run. 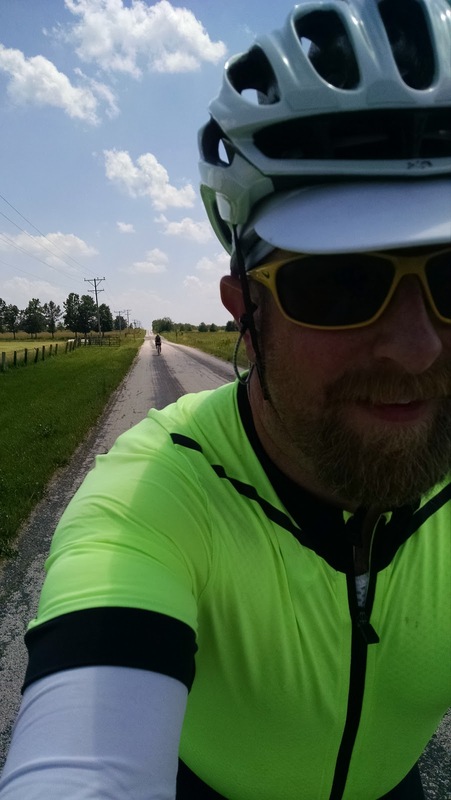 Railroading and gravel riding meet. Paul in the early miles, leading the charge south. Sometimes randonneuring requires creative thinking. What do we do? Refer to the socks, that's what we do. 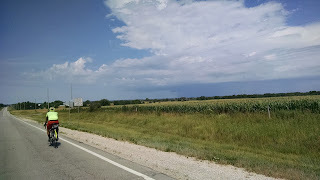 Southbound on Old KC Road. Awesome perspective shot from Josh manages to get all three of us in the frame! That lone rain shower becomes an attention-getter again, so I grab this shot while we enjoy a mid-ride snack at the "We-B-Smokin'" BBQ joint. This little gem is right on the tarmac at the tiny municipal airfield between Paola and Osawatomie, and definitely worth the trip. For under $3.00 you can get a mound of fries the size of your head, and they have cold beer. This was a great ride with a couple great guys. We did a blistering-fast control at Osawatomie and ended up on-pace to do a pretty darn fast 100km, overall - but, ultimately opted to stop for a nice, relaxed lunch at this great BBQ place at the Paola airport instead. Worth it. The two weeks off the bike between vacation and transportation duties keeping me from riding to work had definitely taken a toll. I felt disconnected, lethargic, and heavy... still do. I have to do some serious work to get where I need to be ... that's not the "two weeks" talking, but many, many months of anti-calorie logging and laziness - basically. There's so many goals and aspirations I have on my list suddenly, I'm feeling a bit overwhelmed - so I need to buckle down. While I did "behave" on vacation, I certainly didn't lose any weight - and certainly didn't hit the gym. Enough self-loathing, already. Time to DO WORK. On that note ... why am I spending SO much time at the computer?? The June 200km ride... always a good time. Things like gloves, warmers and ear covers are finally put away and even the early morning hours of loading up the car and preparing to go is easy. The sun rises early and sets late. The birds are out. The roads are calmer, somehow, and moods are good. These are the easy months for the R-12 chaser. As I type this, a cold front has finally pushed through the region bringing some AM thunderstorms and a shift in the wind. Much of the month of June, however, has been hot. 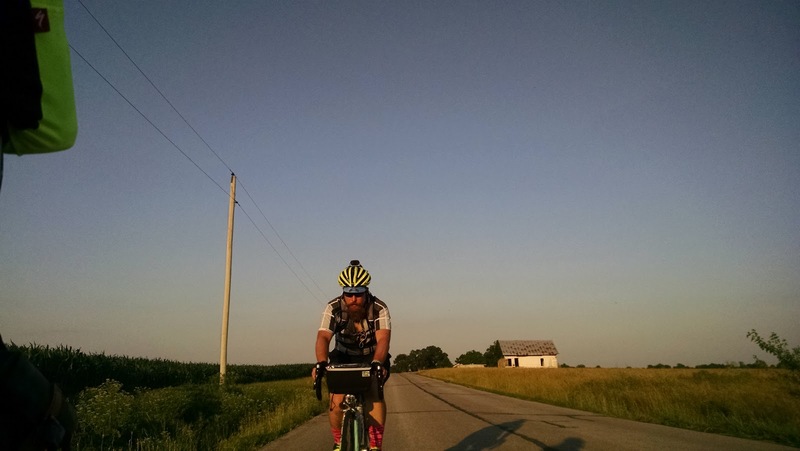 In fact, Steven W.'s successful run at the DK200, only a week prior to this ride, remarkably became the hottest it'd been all year to-date, and many riders had suffered for it. Things that hadn't been an issue all springtime, like carrying extra water, sunscreen, electrolyte balance... what do those things even mean? April and May had both proved almost unseasonably chilly in some regards, and with very little ramp up - BANG - it was summertime hot. As Josh and I readied our bikes in the light of a freshly risen sun, the sweat was already beginning to accumulate on our brows. Normally, not a big deal - but this is the Mighty Peculiar. A route of my own design, the Mighty Peculiar is 218km of rolling terrain and long, unbroken sections of state highways and backroads stringing together, at the onset, much of the last running of the local Kansas City MS-150 routes as they'd stood from about 1996 to about 2010, before the Kansas and Missouri events merged and changed locations and routes. This, the old Sedalia, MO. 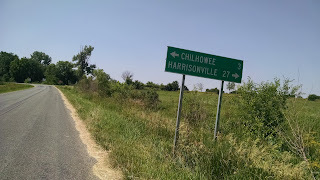 route, runs through Strasburg, Kingsville, Holden, Chilhowee and Leeton before breaking tradition and diverting to Calhoun, MO. for the halfway control. 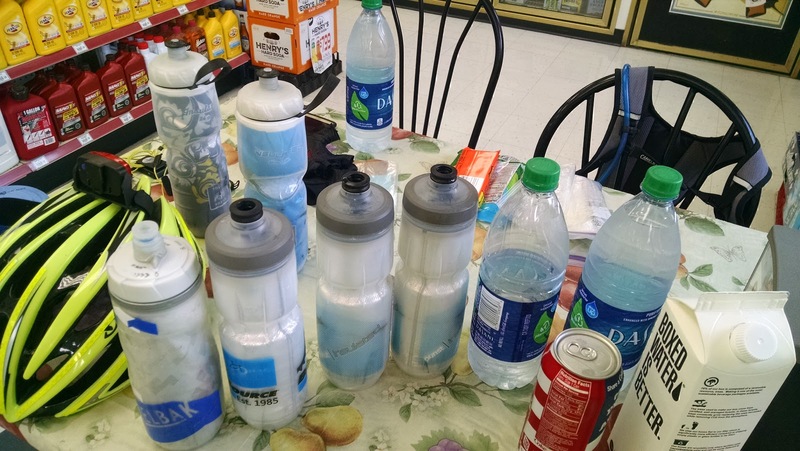 The first portion of the ride is standard 200km fare, with controls and c-stores spaced pretty evenly along the way for easily planned stops and the normal complement of two water bottles being "perfect". Beyond that, however, things get "interesting". While the profile of the route remains consistent, with only a few climbs worth remarking on, the density of controls drops to almost zero for the last half of the route. The economy of the region, sadly, simply doesn't support much in the way of commerce between towns which haven't been connected to anything since the Rock Island railway stopped operations here back in the early 1980s. Since then, things have - literally in some cases - crumbled, and keeping a gas station or a c-store in business quickly became a losing battle. Since its introduction in 2011, the last half of the route has seen stores close, reopen, and close again - making scheduling a bit of a nightmare and requiring a lot of route updates. 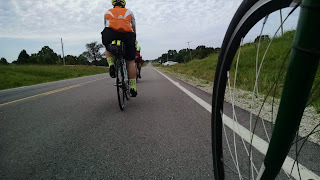 For a few years until only recently, the entire last section of this route required riders to fend for themselves for 67 miles from the halfway to the finish line, without very much of anything in between in terms of vending machines, water hoses, houses, or even shade. During the colder months, not much of a problem --- but, when it's warmer... packing smartly, wearing a hydration pack and riding within one's limits becomes paramount. It's a challenge... a Mighty good one, at that. I gotta say, I (quoting Danny C.) do indeed like a certain kind of misery... and this is one of my favorite routes. I intend to ride it a bit more often, because - at least on the last half - the solitude and low traffic are worth the effort and exposure. In the near future, when the aforementioned Rock Island railroad corridor is finally converted to rail-trail and opened for use, the route will undergo another redesign to offer riders the option to explore then new trail and some shade... but, that long 2nd half will still be there to test those hearty enough to give it a go. I recommend it - for, while challenging in many ways it does help to get out on a piece of road and extend the mental expectation of when a rider sees services. Where most 200k routes tend to have stores and gas stations along the way, even between controls in decent frequency, it's good training - mentally - to experience a route where there simply isn't anything. 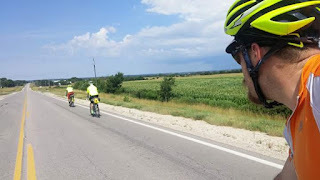 It can set a person up to push their horizons and tolerance for ever-longer intervals in the saddle between stops so one knows what to expect on longer brevets, and has one consider logistical challenges and self-sufficiency on new levels. If it were easy, everyone would do it. 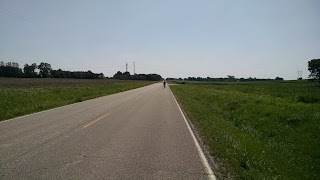 The expanse of West Central Missouri opens up ahead of us, on State Route J east of Peculiar, MO. The sun is already beating down, promising temps in the upper 90's, heat index even higher. As we made our way east, Joshua engaged the Turtle Rescue Squad tactic twice, helping a couple of box turtles get safely across the highways. 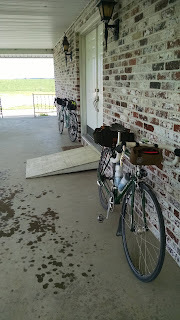 As MO-58 unfolded, we slipped through Strasburg and Kingsville and arrived in Holden for the first control. The heat... we found some good shade on the east side of the building while we enjoyed our resupply and prepared or the next section out to the halfway point. The arm coolers came out for some sun protection - a cycling innovation that I'd been quick to poo-poo in the past, but have since proven indispensable on days like this one. I'm not quite sold on the knee coolers, but, I have considered them. If a ride like this became a week-long tour, perhaps they'd be a good idea. 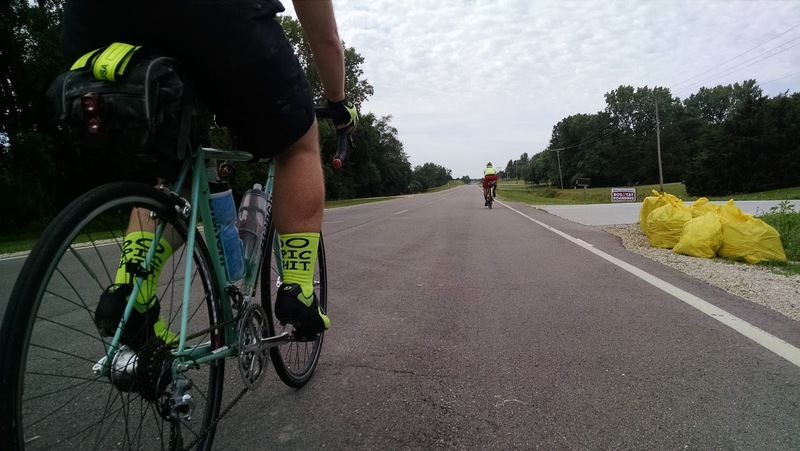 We ventured back out onto the route and made our way out onto Route O and toward the first encounter with the Rock Island Railroad trail conversion. 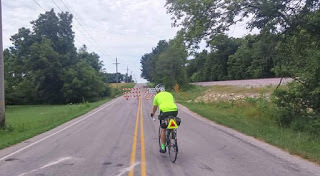 So much has happened in the last few years since I'd been out on the course with regards to the long-awaited rail-trail connector from Kansas City out to the Katy Trail. Someday soon - reportedly before the year is out - cyclists will be able to ride a short distance out to this connector, and then onto the Katy Trail, practically being able to ride across the entire state without touching public roads. To the west, the work near Osawatomie, KS. 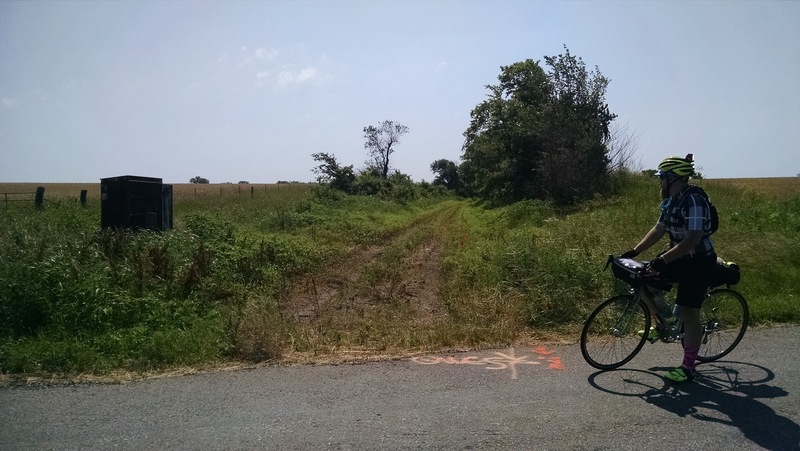 continues towards improving how riders access the Flint Hills Nature Trail, which will accomplish the same feat nearly to the Colorado border. While a lot of work is left to be done, the dream for the adventure tourist is coming true. I can't wait to take advantage of this, but it's still very satisfying to see the progress unfolding. The old switch box is still here, which is really cool - and we really do hope that they keep it here just as a visual reminder of what was once here. 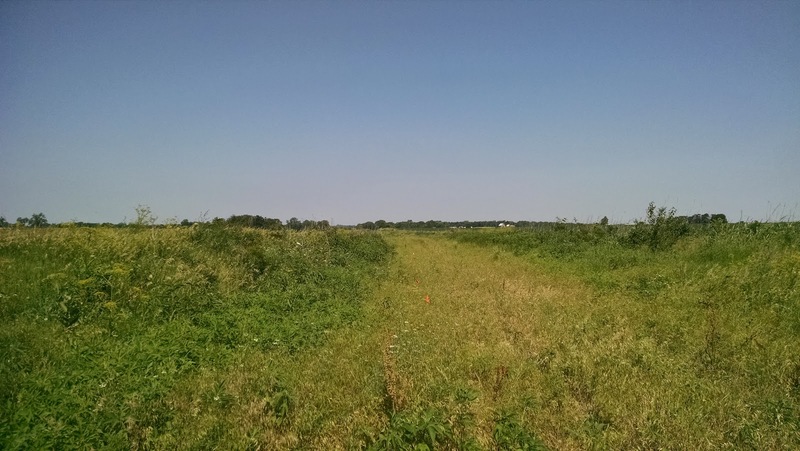 Since a lot of clearing and rail removal has already taken place, and full pea gravel improvements only a couple miles east of here, maybe they're thinking what we're hoping! Some of the Rock Island hardware out here in the weeds dates back at least 60 years, and I've found tie plates with weld marks indicating manufacture in the 1910's. Here, in 2016, Josh and I survey the progress. 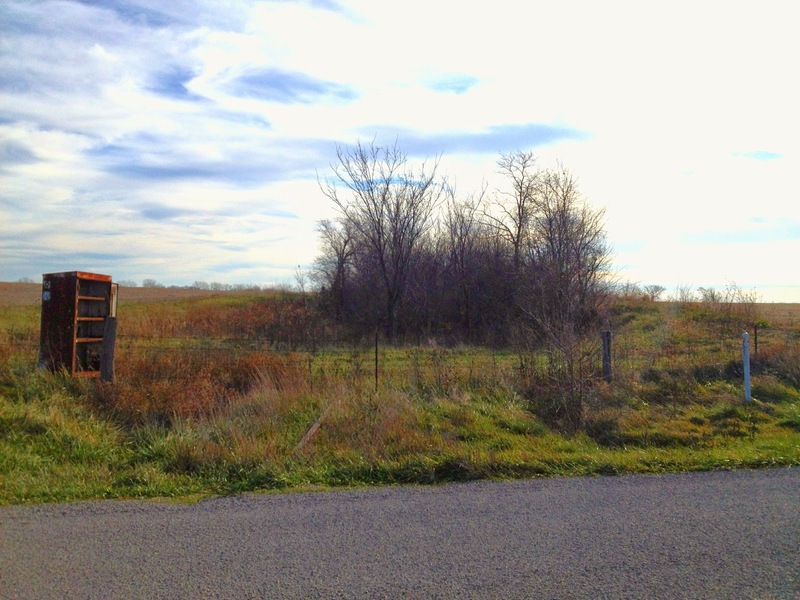 From November of 2013, here's the same view point along Route O..
From 2011, another section of the railroad sits and waits. 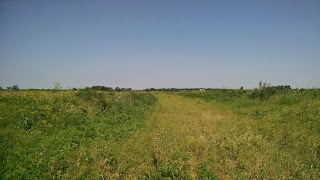 From 2016, looking back west from the same place along Route O, the rails are gone and the brush is slowly being removed. On the pavement below the shot, spray markings from utility companies are evident, as the corridor will likely be used to bring fiber connections to the small towns along the abandoned rail line. After leaving the rail trail crossing behind, we continued east to Chilhowee, MO. and beyond on highway 2, soaking up the great hills I remember from the MS ride days. 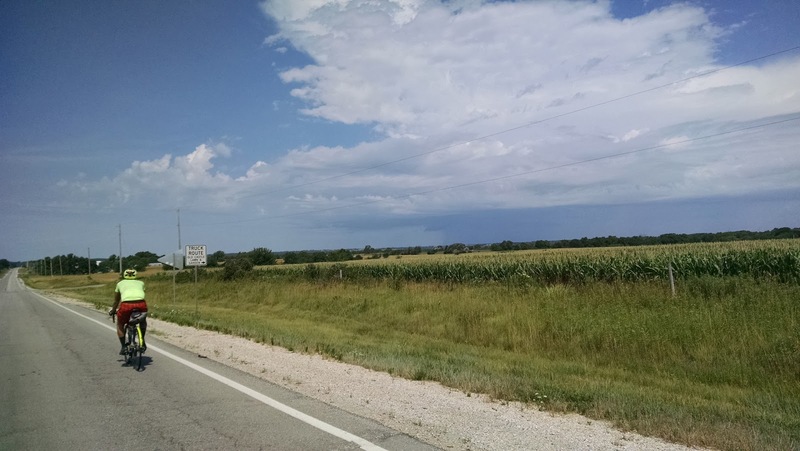 This string of hills was always surprising and became the sole topic of conversation at the lunch stop, which was usually in Leeton only a few miles beyond the crossing of MO-13. It's still a critical stop, turns out. Running low on water again as the heat of the day increased, we hit the shade of the roadside Casey's and refilled our bottles. From there, the opportunity for some choice stops would evaporate quickly. 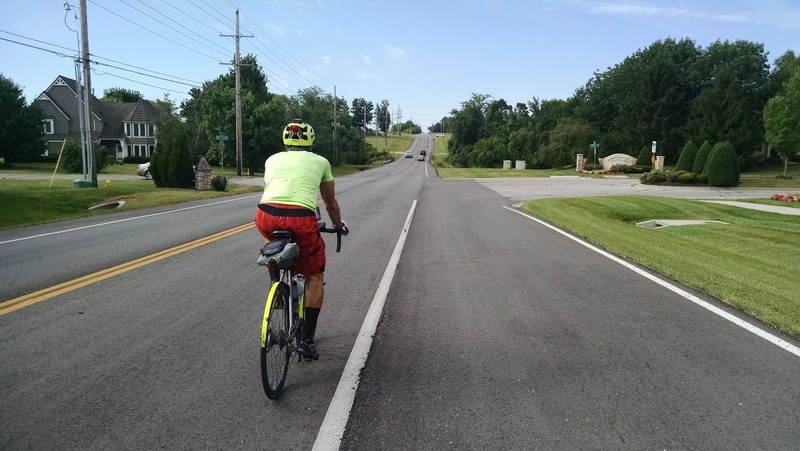 Josh eats up the miles approaching Chilhowee, MO. The miles mounted and soon we were entering the small town of Calhoun, MO. for the halfway control. In my mind, this is where the real ride begins. Yeah, yeah... maybe it might have been easier to simply make this an out and back route, but the traffic density back in Holden and Kingsville increases dramatically after midday along MO-58 (one of the reasons the MS folks ultimately moved the ride, especially on the return from Sedalia on day two) so, while possible it certainly doesn't make for a good time. Sometimes, to get just the right feel for a route, the loop is the only way. At Calhoun, preparing for the 50-mile expanse of "nothing" before the penultimate control, we develop a bit of a drinking problem. The eight beverages in the foreground are all for me, yes; nearly 200oz. of liquids - mostly water, with one caloric addition added with the 16oz. Coke can. With about 85% used for drining, and the other 15% for dousing myself to keep cool and prevent cramps, I ultimately would use every drop before arriving at the next stop. It seemed ridiculous, needing to almost make two trips from the c-store table to the bike and back just to get everything situated, but it was well worth it. Temperatures in the mid-90's and rising, and humidity remaining firmly in place, and me without a Camelbak, well - what choice was there? I will say, the all-road bikes I've seen at events like DK with four or more bottle cages are beginning to make a lot of sense, but, the full-back-pockets and saddle bag works quite well. Not all days are like this, but, faced with a long unsupported section - which Josh had dubbed "The Desert" - it's better to carry more than one needs, rather than not enough. Missouri State Route J, north of Calhoun, with open skies and fields of rolled hay. 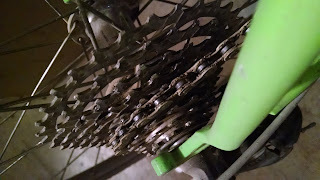 There are long sections of "maintained" pavement that had me questioning my tire size choice - but, mainly only because I'd had the 700x35mm tires of the gravel bike as a new comfort yardstick. I've certainly had worse times on worse roads - but, having the immediate comparison in my head proved frustrating sometimes. Arm coolers, check. Josh and I rolling along Route M, no shade in sight, and constantly fooled by false-alarm flat tire checks, which turned out to be the sun-baked road tar slowing our progress. You know it's hot when the road begins to melt. Yikes. 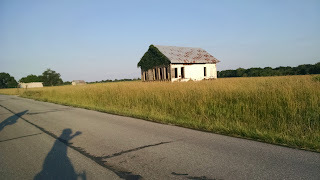 The Corinth Baptist Church, somewhere along Route M. No well, no spigot, no hose, no pump... but shade. We'll take some shade, please. Outside the shade, it's almost too bright to look around for very long. Welcome to the hottest part of the day. The answer is "N O". The questions being, "are we there yet?" and "is there a store in this town?" 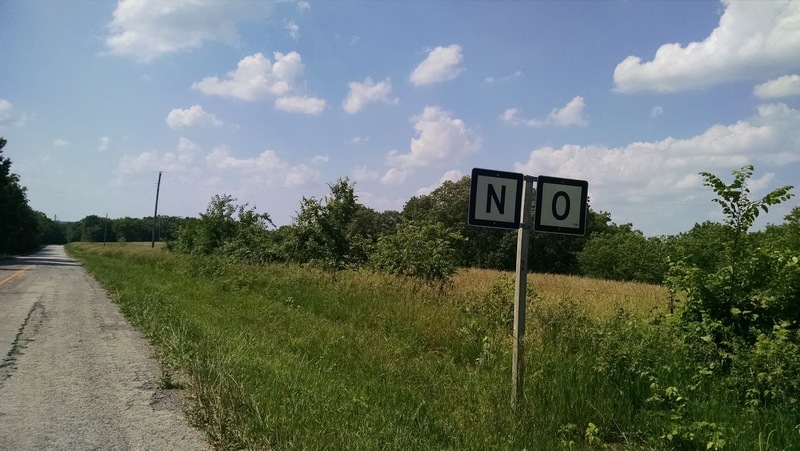 Yeah, "no." 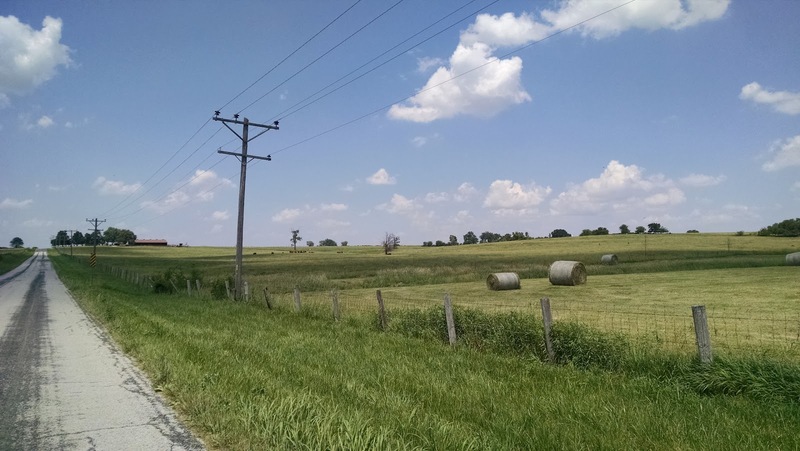 We stopped along the roadside in Blairstown, MO., only a few miles from here, to grab some shade and dig deeper into our reserve water supply. 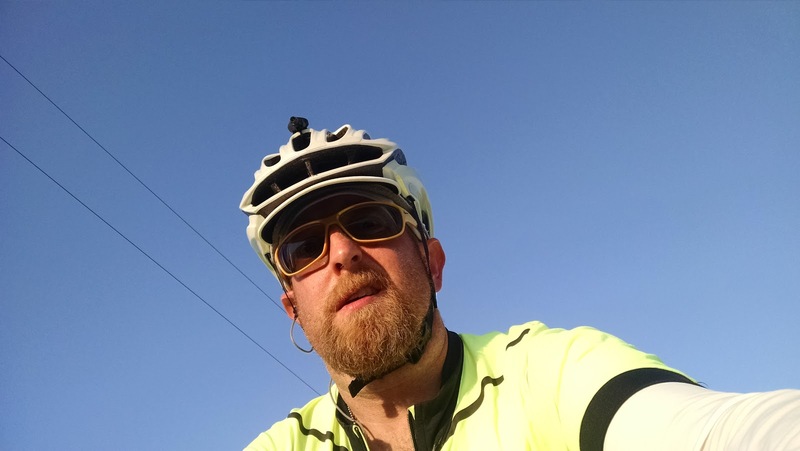 My saddlebag and beer koozie had barely kept my 16oz. can of Coke from Calhoun cool enough to enjoy - and it tasted great. Right before leaving, I realized what had looked different about this odd little town: Josh and I were taking our break next to a large pile of rubble which used to be the only store left in town. Any chance of this becoming a control again are pretty much gone, thus the reason for the long stretch. The original control had been a small c-store, but it had only lasted a few months before shuttering back in 2012. There's a post office, but I've never been here when it's been open. I've tried for Blairstown, as it's well-positioned along the route compared to other options, but there's just nothing here anymore. Time to keep moving. 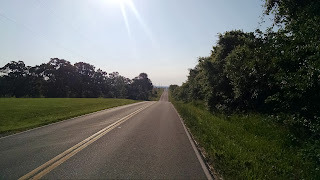 The breaks along the way helped tremendously, but, the cumulative toll of being out and active in a heat index approaching 115ºF were certainly evident. Sunscreen wouldn't stay in place anymore... it was like it melted off the skin. Aside from dodging large hunks of missing pavement, the roadway behavior also involved trying to find a good line on the road that didn't happen to be melting in the intense sunshine and heat. What had seemed like a dragging brake or a soft tire ended up being very soft pavement, which would often make loud cracking and popping sounds as we rolled over the tops of bubbles in the liquefying tar. I think I've only had that happen one other time over the decades of road miles behind me - it was remarkably hot, for sure. Keeping the extremities cool helped, but I was ever watchful of remaining water to ensure I'd have enough to drink in. Electrolyte tabs came in at the top of every hour, in addition to the steady diet of Skratch Labs drink in the insulated bottles on the bike. I was happy to have never cramped up on this section - more water, rather than not enough, is always a good thing. But, the National Weather Service calls them Extreme Heat Advisories for good reason - we certainly weren't breaking any speed records, and it was obvious after Blairstown that some cold A/C and fresh ICE water would be really, really nice. Gotta get to it, though... so, reluctantly, we saddled up for the next section between Blairstown and Gunn City, the next town on the map that would at least have some trees. An old farmhouse stands against the elements along Route N, as we inch close to the turn north back toward "civilization"
One could even say "it LOOKS hot." -- something about this shot seems to sum it up perfectly. Even as the shadows lengthened and the day slipped to late afternoon, the indicated ambient temperatures on our devices hovered around the 97-99ºF mark. Seriously, how long IS this road?? Route N out of Blairstown proceeded to beat me senseless with it's dried-out asphalt fractures leaving scattered rock and elongated potholes all over the roadway from curb to curb and leave me with daydreams of larger tires, but soon we crossed into a new county and things improved dramatically. From here, we began to see the signs of improvements as we entered the far eastern reaches of Garden City and right about the time when I'd normally begin to wonder "shouldn't the turn be here by now? ", the turn north on Highway ZZ appeared. At about time time, Josh and I got separated - different shade schedules and different road speeds is all it boils down to, but we ultimately joined back up in La Tour, MO., right at the return to MO-2. I rested for a minute or two under some deep shade trees - which felt amazing compared to pedaling along under hot sun. Regrouped, we decided to continue onward and see what the next town held in store. While only five miles up the road, it was still five more miles in the oppressive heat. We buckled down, and saddled up. HTFU, you say? Even the Tour of Qatar and the Tour Down Under (or, Oondah (LOL)) are held in January each year, not June (or October). Even the UCI would alter the start times if the Grand Tours had days like this one, and they have support cars. I invite those quick to judge with the following notions of "you had to be there" and an open invite to join me for this route next time out. We are bad-asses. Come ride with us. Don't take this too seriously. We don't. We just wanna ride. A LOT. Hitting stride, we arrived at Route M and made our way toward Gunn City, MO., and what would become salvation. In my control-focused state, I initially arrived at the curve in the road near the old gas station (which has always been closed in the past) and had full intent to carry onward to East Lynne and the real control ... but, seeing the door swing open and someone carrying a bottle of water... or something ...I couldn't go any further. This is teh rando-norm: see store, will stop - control or not, it's allowed. But, I had to make a full u-turn to get this one, being on a 15-second mental delay. Under the shade, and with Josh close behind, we stopped into our new Oasis, Mike's Place. Cold Beer, the sense that there was also food to be had (though we didn't order anything), and most importantly, cold soft drinks and water. We refilled and stocked up and soaked in the cold A/C and shade. IT may be a literal hole-in-the-wall, but it's the best little c-store & watering hole for miles and miles and miles. The timing was perfect, as the heat of the day had just begun to break as the sun marched back down toward the horizon and evening began. Thank goodness... we survived "The Desert". After our provisional "control" was done, we returned to to road refreshed and recharged, ready to wrap things up. We hit East Lynne in good time, then made our trip north and west - stair-stepping back toward Peculiar, just in time to watch the sun dipping toward the horizon ... just like we'd watched it rise in front of us as we prepared for the day almost 14 hours earlier. Yeah, at nearly 219km, it's a longish "200k", but thank goodness for the extra time - we finished with a bit less than an hour to spare, having managed our time wisely despite the tough going in the last half. I quote Steven Williams' battle-cry from his DK run, which - if I recall correctly - is a quote from yet another randonneur: "relentless forward motion." It works. When in doubt, just. Keep. Pedaling. Even "slow" is "progress"., and it'll get you there. Finishing is everything. Stay tuned, and stay cool... starting to get caught up on ride reports and photo-logs, and the next post isn't far away!